Tallahassee, Fla. – The summer months are here, when more people are traditionally on the roads. Traffic congestion has been cited as a reason why the number of auto accidents have been going up and it also can increase the chance for vehicle windshields to be damaged by rocks and other debris. The Property Casualty Insurers Association of America (PCI) warns Floridians not to become a victim of fraud when having a windshield repaired or replaced. 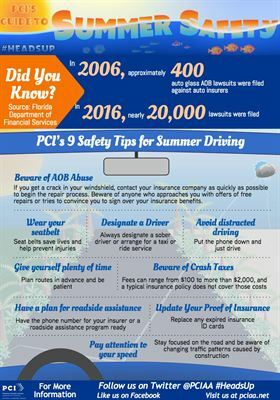 According to the Florida Department of Financial Services, in 2006, approximately 400 auto glass AOB lawsuits were filed against auto insurers. In 2016, nearly 20,000 lawsuits were filed. AOB abuse also has exploded in the homeowners insurance marketplace as well. Legislation designed to rein in the abuse failed to pass during the 2017 Legislative Session. Avoid distracted driving. Don’t talk, text or use apps while driving. Put the phone down and just drive. Try to limit other distractions, such as eating or fiddling with controls, and be aware that having more passengers in the car multiplies the opportunity for distraction. Secure pets in the back of the car. Designate a driver. If you plan to drink at a summer celebration, always designate a sober driver or arrange for a taxi or ride service. Wear your seatbelt. Whether you’re taking a summer getaway or just running errands around town, buckle up and drive safely. Seat belts save lives and help prevent injuries. Also, make sure kids are in the proper car or booster seats. Give yourself plenty of time. Plan ahead and allow extra travel time. With more people on the roads, often driving in unfamiliar territory, the potential for a traffic crash increases. Plan routes in advance when traveling to new destinations and be patient. Pay attention to your speed. Observe speed limits, including lower speeds in work zones. Stay focused on the road and be aware of changing traffic patterns caused by construction. Be especially cautious around construction workers. They’re often working close to the highway and are at great risk. Beware of AOB abuse. If you get a crack in your windshield, contact your insurance company as quickly as possible to begin the repair process. Beware of anyone who approaches you with offers of free repairs or tries to convince you to sign over your insurance benefits. Beware of crash taxes. Although crash taxes have been banned or limited in several states, many cities, counties and fire districts will charge the at-fault driver for the emergency response costs of an auto accident. Fees can range from $100 to more than $2,000, and a typical insurance policy does not cover those costs. Have a plan for roadside assistance. If you’re involved in an accident, beware of unscrupulous towing companies. Some towing companies take advantage of drivers after an accident by charging excessive fees and making it difficult for people to retrieve their cars. Have the phone number for your insurer or a roadside assistance program ready. Update your proof of insurance. Before hitting the road, replace any expired insurance identification cards so you can provide current proof of insurance during a traffic stop. Before hitting the road, replace any expired insurance identification cards so you can provide current proof of insurance during a traffic stop. Observe speed limits, including lower speeds in work zones. Stay focused on the road and be aware of changing traffic patterns caused by construction.